I was in Staples this week picking up some paper for our laser printer. While I waited for them to check on an item, I wandered through the pencil and marker aisle. While most of the markers were of the “designed for kids” variety, they did have a tiny section of art pencils and pens. Since I’ve only been using colored pencils up ’til now, I decided to buy a small set of art markers to try out, and this Staedtler triplus color set fit the bill. I have to say I really like the packaging on this set. The plastic case is not only well designed for holding the markers, but the cover folds back and turns the case into a stand. That said, I don’t like that there are no color labels on any of the markers. Based on the color list on Amazon, each marker does have a specific color name – it would be nice if the name was printed on the barrel. 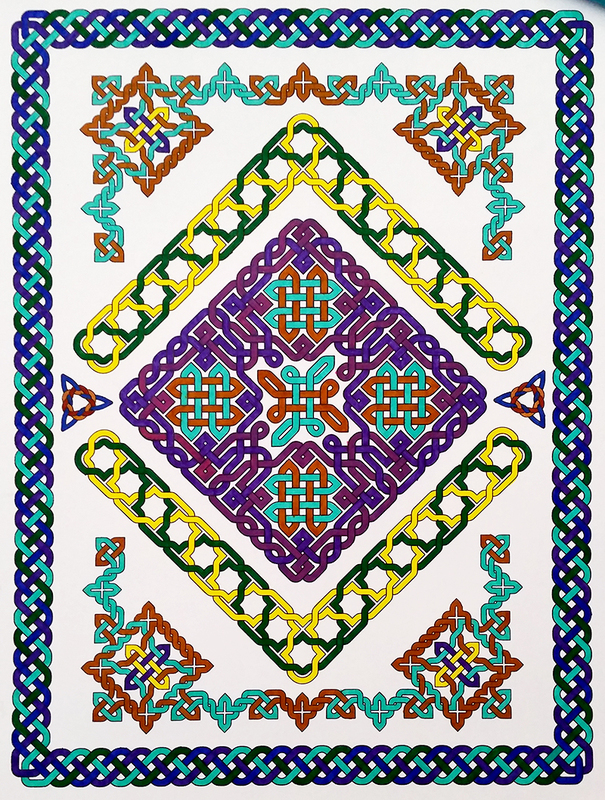 I used the markers on a Celtic design I printed on some 68lb card stock. I was pretty pleased with the results. The thing that has always bugged me about markers were the “stroke marks,” where you can see where you overlapped the color to get full coverage. I thought that would be the case with these as well, but I found that as long as you are working steadily, the overlap marks disappear as they dry. The markers have a medium fine tip, so they’re good for small details, although they wouldn’t work for really fine lines. 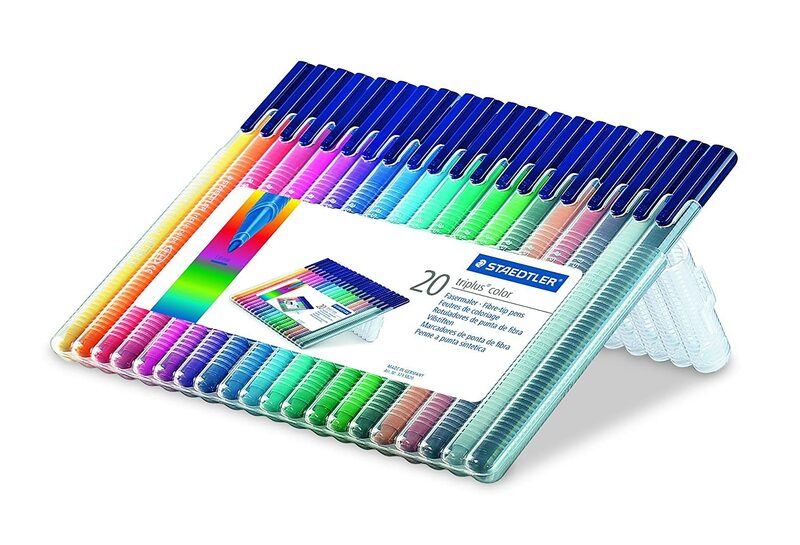 I also wouldn’t use these for large areas of color – I’d be worried that I would run the marker dry – although one of the reviews on Amazon says they last forever. On the cardstock, there was very little bleed, so I was able to color without worrying about the color spreading outside the lines of the design. The only time the color ended up outside the lines was when I accidentally did it myself! In one section, I wanted to have 2 shades of purple, but the only purple in the set is very dark, so I decided to blend the palest pink and the palest blue to create my own lighter shade of purple. My test color looked about right, but I made the mistake of testing it on something other than the same cardstock as my design. When I blended the two colors on the actual design, they blended into a purple almost as dark as the already existing marker. TIP: When testing marker colors and blends, always test on the same kind of paper as your final design! Of course, I didn’t want to start over, so, without even testing it, I decided to “fix” the color by doing a third layer of the light pink. While it did change the color, it also muddied it up, giving a somewhat unflattering pinkish/purple shade. Lesson learned! Test first! Even though I don’t really like the color I got, I finished the design, and among all the other colors, it doesn’t look too bad. However, speaking of blending and layering, I found that for a lot of the colors in my pack of 20, I could actually get multiple “colors” from each marker. The paler shades are especially well suited to this. The first layer will be a very pale version of the color, but you can add a second and sometimes a third layer to get a gradation in the same color family. When adding more than one layer of color, the additional layers will bleed more than the first layer, so you do need to keep an eye out for that.